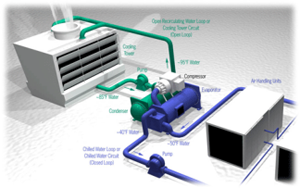 Primarily used to cool water in air conditioning systems, cooling towers are also used to cool in process water. Many people tend to overlook the significance of a cooling tower to the overall energy efficiency of a cooling system and will ultimately delay on their necessary cleanings. Minimizing the risk of biological growth and other diseases such as Legionnaires is just one important reason to keep your cooling tower clean and running efficiently. Good housekeeping measures such as regular cooling tower cleanings and effective water treatment programs are the best protection against a Legionnaire’s outbreak. The Synergy Cooling Tower Cleaning Service will be one of your company’s most cost-effective solution for this problem. At the completion of our cleaning process, your cooling tower and its components will be sanitized, clean and ready for service. At Synergy Water Solutions, we have highly trained technicians who perform our cooling tower cleaning services in a very efficient, cost effective and environmentally compliant manner. This service will reduce biological accumulation and growth and eliminate the need for future expensive shutdowns, equipment breakdowns and manual cleanings in the tower. Reduce your operating and maintenance costs by maintaining the critical link in your air conditioning or process cooling0 system. Fouled cooling tower fill can seriously reduce your operating efficiency, increase overall costs and shorten equipment life. Even towers with reasonably effective water treatment programs can still suffer from silt, mud and other organic deposits which accumulate over time on fill areas. These deposits can be removed economically with the Synergy Cooling Tower Cleaning Service. The key is to perform regular and consistent tower cleanings to avoid disasters in the future.